Alexa is headed to Amazon's Android shopping app beginning this week, joining Amazon Echo speakers and iPhones as yet one more place where the digital assistant can try to make its mark. Alexa's Android arrival comes via the dedicated Amazon Shopping app. The app's Google Play Store listing indicates it was updated on July 19, though there's no official mention of Alexa integration in the description, so it could be updated again when Alexa officially arrives. 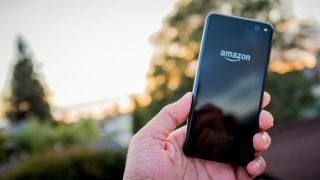 Amazon told us when Alexa launched on iOS in March that an Android version was in the works, and today Amazon confirmed Alexa's arrival on the Google operating system to TechCrunch. Just as it does on iOS, Alexa in the Android app works much the same as it does on Echo. It can perform tasks like check the weather, traffic and news, tell jokes, stream music, track past Amazon orders, and even control smart home gadgets. Alexa on Android can also perform various skills, like launch the Netflix app and order you Starbucks. Alexa inside the Amazon shopping app on Android looks to be slowly making its way out to users. While it may not be feature-full enough or, you know, natively built-in, to convince you to wholly switch from Siri or Google Assistant, slipping Alexa into the major mobile ecosystems is a smart way for Amazon to expose its assistant to more people. While there is a dedicated Alexa app, it has between 5,000,000 - 10,000,000 installs on Android, compared to the Amazon Shopping app's 100,000,000 - 500,000,000 installs. Yeah, we can see what Amazon's thinking here.